We have seen a huge increase in the amount of student voice at our school in our time at Rainier Prep. One of the big ways this comes about is through the group of students that make up Student Parliament. 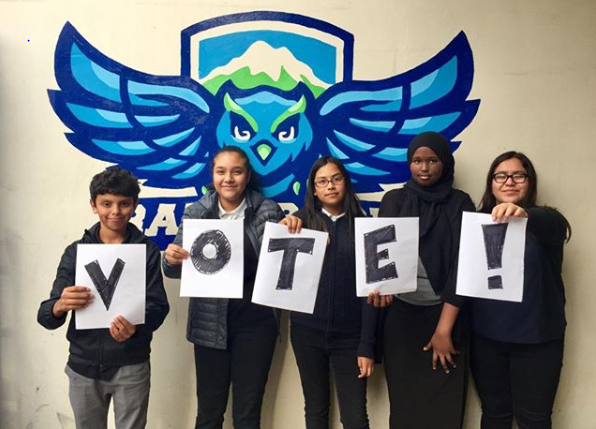 Student Parliament acts as the student government at our school, taking input from students through weekly advisory reports, voting on proposals, and creating a series of events to increase student engagement and excitement at our school. Before Student Parliament, we had no clubs. However, once students were able to meet and determine goals, they learned how to bring their innovative ideas to the group and make them a reality. Student Parliament recently created two after school clubs, an LGBTQ+ club and a Study Buddies Club, both of which meet once a week. There is now a group of 5th graders working on developing an after school Yoga Club! In addition to clubs, Student Parliament members have created and organized four sports tournaments, taken on personal projects like filming and editing news videos, helped students solve problems through peer mediation, and have now begun to run school-wide monthly challenges as positive incentives for attendance, reading growth, and homework completion. When students are empowered to make decisions, it’s amazing the things they can come up with.